Nottingham High Street @ High.St - High Street shops and High St businesses. Large Google map of Nottingham High St.
Nottingham - home to the legend of Robin Hood and his Merry Men. Some places you visit just feel good, and Nottingham is one of those places, especially if you've left your car at home! Nottingham has done a really good job of combining the old and the new, and combining the small town 'high street' feel with the modern shopping mall. You can wonder for ages from mall to arcade along pedestrianised streets lined with the big high street names; most of the independents are relegated to the many side and connecting streets. 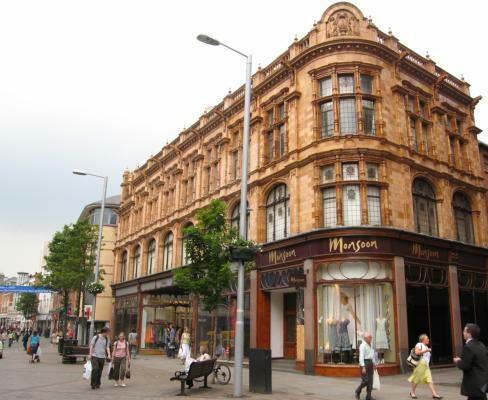 Nottingham surveyed, shops will be listed soon. There are so many shops here we couldn't map them all, so below we show those shops and businesses on the pedestrianised areas, plus the main shopping centres: Broadmarsh and Victoria Centre. This comprises two North South streets leading to Broadmarsh and two West East streets that cross them. Of course Nottingham is not just about shopping and there is plenty to see in and around Nottingham. Such as a visit to Nottingham Castle, the City of Caves or the Galleries of Justice. And if you're really unlucky, you might just meet Robin Hood demanding your surplus cash to feed the poor! For more about short breaks and forthcoming events, try the Visit Nottingham web site.